The GutterSnipe is the fifth virtual organ in the FreeST range. 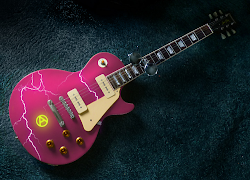 It has a new tone engine and voicing, specifically geared towards rougher, heavier sounds. The new design includes analogue waveform stereotyping, an unusual ten-drawbar tone system, powerful overdrive, built-in delay and tonewheel organ-style chorus unit, and dynamic crushing for that ‘speaker cracking under the strain’ feel. A newly tailored version of the Real Rotor speaker simulator is also built in. The GutterSnipe allows more aggressive sounds than previous FreeST organs, due to its guitar amp-style pre-gain structure. In response to feedback on version 1, the instrument is now on its second version, which has a fatter and more toneful sound than the original, along with some logical design and layout changes. The new layout is as follows. 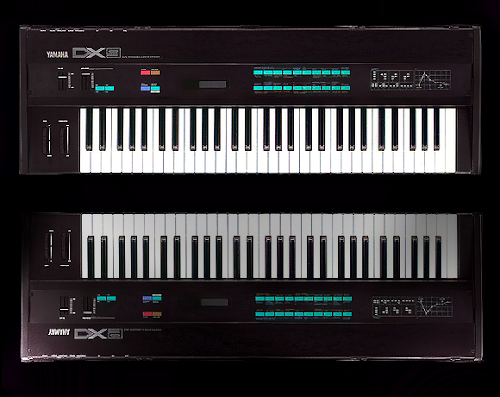 There are ten drawbars. The first eight of these are similar to a Hammond set, except: a) their tone is a little more complex than the sine wave which would be produced by tonewheels, and b) the 1 3/5’ drawbar is missed out. Because this organ is designed to be overdriven, and a major third disrupts the smoothness of distorted tones, the 1 3/5’ (which produces a major third above the 2’ bar) was eliminated. After the first eight drawbars, there are two new ones which don’t exist in the Hammond-derived system. The first of the two is marked S1 (the S stands for String), and produces a fundamental tone with a bright, string-type character. This really fills out and perfectly augments the tone of the eight classic bars. The second is marked S2, and produces the same tone as S1, but with a raised pitch of one fifth. Both of these new drawbars are instrumental in creating the GutterSnipe’s hot sound. You can select from some example presets by clicking on the green Preset Selector to the left of the keyboard. Above the Preset Selector are the controls for the Rotary Speaker. To switch the rotary effect on, toggle the On button. To switch between slow and fast rotation rates, (chorale and tremolo respectively), toggle the S/F button. Just to the right of the Rotary Speaker controls are the Drive and Volume sliders. 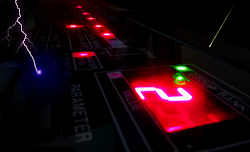 Drive pushes the gain of the amp simulator up into powerful overdrive as you move the slider upward. Vol adjusts the master volume of the instrument, helping you compensate for the changes in level as you crank or back off the Drive. The Vibrato Chorus Effect has three parameters. Depth adjusts the depth of the vibrato or chorus, and Speed adjusts the cycle rate. With the Chorus slider up (showing a value of 1), the effect will perform as a chorus. With the Chorus slider down (showing a value of 0), the effect will perform as a vibrato. The Digital Delay Effect has three parameters, plus an On/Off switch. The Time slider adjusts the duration between each repeat. Push the slider upward for a longer delay, and downward for a shorter delay. The Feed slider adjusts the feedback. This is the actual number of repeats. Move the slider upward to produce more repeats, or downward to produce fewer. The Mix slider adjusts the volume of the repeats. Move the slider upward for louder repeats, or downward for quieter repeats. The volume of the original signal will not be affected. The CPU drain is still a bit higher with the GutterSnipe than with previous FreeST organs. However, the footprint has been reduced in version 2, so things are moving in the right direction. The FreeST GutterSnipe is supplied as a VST plug-in only, and is downloaded as a simple, ready-to-use .dll file. After downloading the .dll file, place it in your VST host’s VstPlugins folder. Most VST hosts will then detect the instrument automatically. If you normally have to add your VSTis manually, please use the same process to add these. 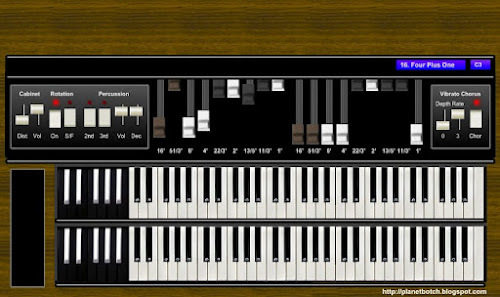 Before downloading this VST organ, please be aware that it is freeware, created by a hobbyist and not a professional organisation. Every effort has been made to ensure that it works effectively and fulfils its role well. However, it is in no respect guaranteed bug or problem free, and is downloaded and/or used at your own risk. In opting to download or use the FreeST GutterSnipe you absolve its creator of any responsibilty for any problems you may encounter as a result. Anyone interested in the original Version 1 of the GutterSnipe, as demonstrated HERE and HERE, can still get it on THIS DOWNLOAD LINK. 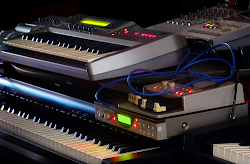 If you're new to the site, please visit the Music Making page for links to the other FreeST VSTis/effects.